The Walk of Life is located in our beautiful Kaminski Park adjacent to the Institute. This exquisite area offers you the opportunity to pay tribute to a beloved family member, friend, co-worker or health care provider. There are also options in areas on campus such as the Research Studies Center. And with your personal inscription, you will create a legacy that will last forever. 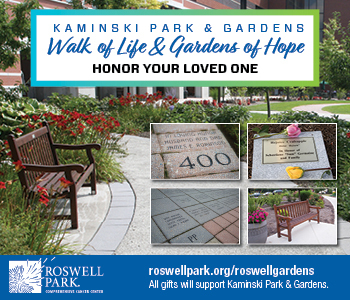 The park features inscribed pavers, trees and perennial gardens dedicated to loved ones. The park offers sanctuary for people to sit quietly, to read and reflect, or to join family and friends in conversation. Learn more about Waldemar Kaminski and the legacy that he has left Roswell Park and our patients. Download our newest Walk of Life brochure and order form. Please note: All benches in Kaminski Park have been named. A limited number of benches are still available in RSC Gardens. Please call 716-845-4391 to find out more. Thank you for your support.